When you visit the eye doctor for a checkup, you may be asked to read an eye chart. The chart measures your visual acuity or sharpness of vision. If you don’t wear glasses or contacts, your eye doctor will use the results to find out whether you need them. If you already wear corrective lenses, the test results will tell your doctor if your glasses or contacts prescription needs to change. The most commonly used eye chart is known as the Snellen chart. It usually shows 11 rows of capital letters. The first line has one very large letter. 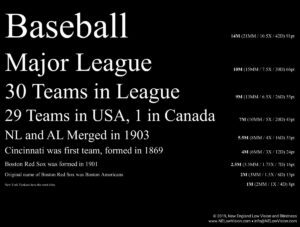 Each row after that has increasing numbers of letters that are smaller in size. 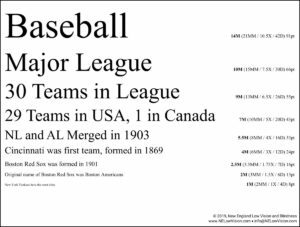 You stand 20 feet away from the chart and read from it without your glasses or contacts. You cover one eye and read out the smallest line of letters you can see. The test is done on each eye. In some offices, the chart is viewed using a mirror so the test can be done with less than 20 feet of space. The results are the same whether or not a mirror is used. If you have 20/20 vision, you are considered to have normal visual acuity. The top number refers to the distance in feet that you stand from the chart. The bottom number indicates the distance at which a person with normal eyesight can read the same line you correctly read. 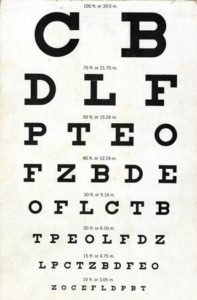 A person with 20/20 vision can see what an average person can see on an eye chart when they are standing 20 feet away. Dutch eye doctor Hermann Snellen developed the Snellen eye chart in the 1860s. He was a colleague of Dr. Fransiscus Donders, who began diagnosing vision problems by asking people to look at a chart on a wall and tell him what they could see. According to The New York Times, he asked Dr. Snellen to make the chart. Dr. Snellen also created a chart called the “Tumbling E” chart, which can be used by people who cannot read, or by young children who don’t know the alphabet. Instead of using different letters, the “Tumbling E” eye chart uses a capital letter E that faces in different directions. The eye doctor asks the person being tested to use their fingers to show the direction in which the “fingers” of the E are pointing. 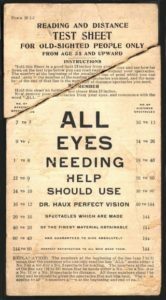 The eye chart came along during a time of rapid industrialization, when good eyesight was needed for an increasing number of jobs, from railroad engineers to factory workers, Benjamin says. Your visual acuity is measured as part of an eye exam. The American Academy of Ophthalmology recommends that you get a baseline eye examination at age 40, the time when early signs of disease or changes in vision may occur. Eye charts do not help the eye doctor tell whether you have an eye disease such as glaucoma or a problem with your retina. They also do not measure other vision problems such as loss of peripheral (side) vision. To learn more about any of our products and services or to schedule a no-obligation demonstration, contact a Technology Specialist at New England Low Vision and Blindness to learn more. You can also call our toll free number 888-211-6933 or email us at info@nelowvision.com.